Architect Charles Duggin was actively developing the east side of Manhattan in the years following the Civil War with his partner James Crossman. A young, promising architect, Charles Buek worked for the partners as they designed rowhouses for Manhattan’s moderate and upper classes. When the firm dissolved, Buek established his own practice, as Charles Buek & Co., and took Charles Duggin with him as partner. Not content to wait for individual commissions, Charles Buek acted as his own developer—aggressively purchasing tracts of land and designing speculative rows of homes. As Central Park took shape, the Upper East Side became more attractive for potential homeowners. It was here that Buek concentrated his efforts. In 1885 the firm began work on a string of brick-and-brownstone rowhouses stretching from No. 21 to 29 East 69th Street. Designed in the up-to-the-minute Queen Anne style, they were four-stories tall above deep English basements. The row was completed a year later. Designed for families with more than average income they were exceptionally roomy. No. 23 was 28 feet wide, nearly twice the width of a normal building lot. The architectural style and its quirky dog-leg stoop with multiple turns would become more identified with the Upper West Side on the other side of Central Park than with the more restrained east side neighborhood. The row filled with distinguished residents. In 1896 No. 23 was owned by Mrs. A. S. Taylor. In the 19th and early 20th century it was common for the well-to-do property owner to put the title of the family residence in the name of his wife, thereby helping to insure her financial stability in the case of his death. Next door at No. 25 lived the esteemed lawyer Elihu Root who would soon become the Secretary of War under William McKinley. In January 1896 Mrs. Taylor lease the house to John Claflin for three years at what the Real Estate Record and Builders’ Guide reported was “an aggregate rental of $16,500.” In today’s dollars he was paying about $11,000 per month. John Claflin could well afford the rent. Claflin was President of the H. B. Claflin Company, a firm founded in 1834 as a middleman between manufacturers and retailers of dry goods. By 1890 it had become the largest mercantile concern in the country. He was also President of the Ninth National Bank and a director in the American Exchange National Bank, the Commercial Union Fire Insurance Co. and the Commonwealth Insurance Co. But only a year after moving in John Chaflin learned that his wealth and position did not raise him above one civic responsibility: jury duty. John Claflin served on a criminal jury and, presumably, his mail service improved. Claflin and his wife, the former Elizabeth Stewart, obviously approved of the house on 69th Street, because it appears they purchased the property. In 1903 a summer estate was added to their holdings with the purchase of “the large stone mansion and 48 acres of land, known as ‘Westerly’ at Morristown, New Jersey, according to The New York Times. That year the company owed $30 million and when some of the creditors asked for cash rather than new promissory notes, a crisis hit H. B. Claflin Company. The company failed. The Claflins left No. 23 East 69th Street and John H. Prentice and his family moved in. Prentice was a banker and stock broker, a member of Clark, Dodge & Co. His family included his wife, the former Kate Harrison, a son, John, Jr., and daughters Caroline and Kate. The socially-active couple hosted elegant entertainments in the house and John was a member of the exclusive Knickerbocker and Union Clubs, while Kate was a member of the Colony Club. But World War I would cast the shadow of despair on the house in 1918. 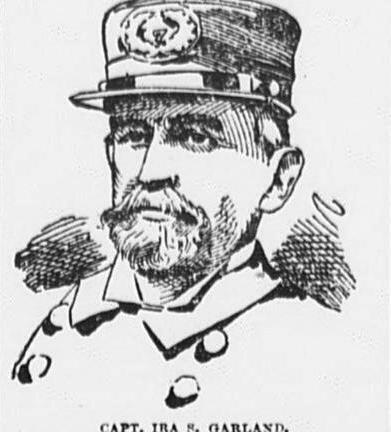 Five days before Christmas the New-York Tribune reported that Major John H. Prentice had been severely wounded. The young soldier never recovered from his wounds. Cheerfulness eventual returned to the house and in December 1921 young Kate was introduced to society. Her parents hosted a dance at the Ritz-Carlton, preceded by a large dinner there. Her sister, Caroline, was abroad that winter; and upon her return the entire family spent the summer at their Southampton estate. That September her engagement to Frederick Cromwell, son of the President of the New York Stock Exchange was announced. John Prentice died in 1925 and Kate Harrison Prentice lived on alone in the house. As the 1920s progressed, tastes in architecture changed. To update their outdated Queen Anne homes, several of the Prentice’s neighbors had the facades renovated. No. 29, owned by Carl F. Boker, had already been remodeled in 1919 by architect S. Edson Gage in a neo-French Classic style. Next door to the Prentice House, Edgar Bernard renovated No. 21 in the popular Georgian style. No. 27 became Tudor in 1927 when Lucretia Strauss hired York & Sawyer to re-do it; and Mrs. Paul Pryibil followed suit in 1929 when she commissioned Noel & Miller to remake No. 25 in the Georgian mode. Kate Prentice left No. 23 just as it was originally designed; the only one of the row to wear its old clothes. She continued to be noteworthy element in New York and Newport society. The New York Times reported on the luncheon she gave at her Newport mansion on August 20, 1941, then four months later it printed her obituary. On December 29, 1941, Kate Harrison Prentice died in the house at No. 23 East 69th Street at the age of 63. Two years later a year-long renovation was begun to convert No. 23, like so many of the grand homes of the Upper East Side in the middle of the 20th Century, into apartments. In the still-exclusive neighborhood the apartments were spacious—only one to a floor, and the exterior retained its single-family appearance. Today, along with the apartments, a fine arts gallery is housed here. The original paneled oak entrance doors survive as does the quaint Queen Anne façade—the sole remaining original of the five. In the first years of the 19th century, the Ward brothers, Jasper and Bartholomew, grasped the opportunities of real estate development in the burgeoning city of New York. In 1806 Jasper purchased the Captain William Lowndes estate consisting of half of the island that sat in the Hell’s Gate section of the East River. The second half was later purchased by Bartholomew, and the land became known as Ward’s Island. The landfill was finally granted and Ward judiciously waited about five years before building on the site—allowing the ground to settle and become stable. Between 1807 and 1808 he erected three brick commercial structures at Nos. 41, 43 and 45 Peck Slip on land which a decade earlier had been under water. Each had a heavy stone base with expansive, multi-paned windows for retail or office space. Above, three floors of red brick with brownstone trim provided office space or rented rooms for seafaring sailors. Henry B. Lambert answered the ad, opening his counting-room here on May 1, 1807. He stayed on for three years. Around the same time Benjamin Deforest moved in. Deforest ran an import-export grocery business, Deforest & Smith, here, bringing hard-to-find items to New York consumers from distant lands. When his partner started his own business and Deforest took in his nephew, the firm became N. Deforest & Co. The wealthy grocery importer would continued to run his business from No. 45 Peck Slip for 17 years. Barnabas Osborn and Philander Hanford, also wholesale grocers, purchased the building in 1824 and twelve years later Osborn bought out his partner. At the same time N. Hubbard & Co., another wholesale grocer, was doing business in the building. The extent of Hubbard’s business can be judged by the amount of cargo it received a decade later in March and April alone. In March the Barge C. Durant arrived in New York with a shipment of 420 boxes of candles for Hubbard. Within a few weeks the Barge Henry delivered 440 barrels of “provisions” and the Barge Brutus docked with 296 barrels of provisions the same month. The building continued to change hands throughout the 19th century. 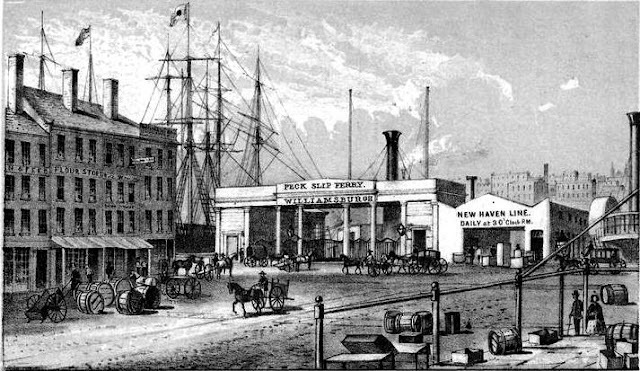 In 1837 Charles H. Pratt purchased it, running his shipchandler business, Pratt & Burr Chandlery, from the location until 1844. Importer Elijah Roberts sublet part of the street level store. The widow of G. B. Miller, a Water Street tobacconist, purchased the building in 1844 and leased it to Peter Hoeft, a liquor dealer, who established his store on the ground floor and lived upstairs. In 1880 Peter W. Hoeft improved the aging building by spending $300 to replace the corner granite post with a 7-inch diameter cast iron column. The old windows were replaced and pressed metal lintels installed. The retail space continued as a liquor store when Frank Glover bought 45 Peck Slip at public auction in 1894. Succession of owners would slow when, in 1918, Mary and Frank Glover purchased the building with Marie and Anna Conlon. The property would remain in Glover and Conlon hands until 1962. By the early 20th century the South Street seaport area was the center of New York’s wholesale fish industry. Fishing boats docked along the waterfront each morning filled with freshly catches which were quickly bought up by the scores of fish dealers. Among them was Acme Fish Company at No. 45 Peck Slip doing business on the ground floor while the upper stories served as a rooming house. The 1920s gained a reputation as a time of rampant organized crime—bootlegging, extortion and strong-armed techniques of gangsters. The seaport’s profitable fishing industry became rife with mob activity. In July 1925 a grand jury heard testimonies of more than forty witnesses who told of attempts to force them out of business because they would not join “the combination” of eighteen wholesale fish dealers. The group, which included Acme Fish Co., controlled over $20 million in fish sales a year; fixing prices paid to the fishermen and paid by the consumer. Fishermen who did not agree to the prices were left with no one to buy their catch. Any retail fish market who bought from a non-cooperative wholesaler was boycotted by the group. One woman, Laura E. Donsdall, who lived on a small plot of land on Pepin Lake, Wisconsin, thought it would be a good idea to sell lake fish. She began buying the catch of local fishermen and selling it on the South Street market. The tiny business was perceived as a threat to the organized dealers who began buying up land surrounding Donsdall “to drive her off her land” and harassing her. David Finkelstein, owner of Acme Fish Co., was indicted on conspiracy to violate the Sherman Law. The company survived and remained at No. 45 Peck Slip for at least another decade. In the meantime, in 1928 architect Charles M. Straub and contractor Joseph Dembeck initiated a one-year alteration that converted the rooming house portion to offices and replaced the old stairs with new and assumedly safer ones. As downtown Manhattan sprouted modern skyscrapers the South Street seaport area remained relatively unchanged. Early 19th century dock front buildings survived essentially overlooked and generally abused. In 1962 the Inamly Corporation purchased No. 45 Peck Slip and that year the other two buildings erected by Jasper Ward were demolished. In 1973 Con Edison announced the construction of a large electrical substation which would wipe out the last of Ward’s 1807 buildings. Instead, however, the power company agreed to building around the lonely and derelict building. Con Edison donated it to South Street Seaport Museum which had been founded only a few years earlier. In 1983 architect Robert E. Meadows headed an ambitious restoration of the devastated structure. Today called the Jasper Ward House, the stranded structure is embraced by a utilitarian power substation that tries its best to fit in to the historic district. The Jasper Ward House is, perhaps, a bit too restored with cutesy pseudo-Victorian painting on the façade more expected in Disney World than on an historic restoration. But it is a small price to pay for the building's rescue at the 11th hour and its subsequent recycling as a viable structure. Unlike its haughty neighbor Fifth Avenue, to the east, Sixth Avenue in the late 19th century was decidedly blue collar. The 6th Avenue elevated tracks blocked sunlight and the passing trains spewed cinders and smoke. 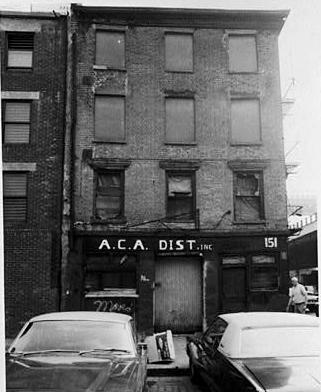 Between 43rd and 44rd Streets sat the 6th Avenue car stables, and at the northeast corner of 49th Street was a saloon owned by three Irishmen. Patrick “Paddy” Daly, Daniel Hurley and his brother Connie took a long-term lease on the four-story, red brick building in 1892. They established a partnership and opened a saloon called Hurley Brothers and Daly. The block was lined with similar Victorian structures, terminating on the opposite end of the block with a three-story brick building owned by the Boronowsky family. Things went well for the partners who reportedly shared the heavy-drinking habits of their clientele at the 54-foot long mahogany bar with bronze fittings. But 27 years later, as with every other saloon in the city, the foundations of Hurley Brothers and Daly would be rocked by Prohibition. Prompted by well-intentioned reformers who believed that the elimination of alcohol would result in reduced crime, increased morality, improved public health and financial stability, Prohibition had other effects. Thousands of New Yorkers were suddenly unemployed—bartenders, tavern owners, brewery workers and waitresses. Hotels and restaurants, unable to survive were forced to close. But the headstrong Irishmen who ran what was known as Hurley’s would not let a simple Federal law get in their way. Within five years after the enactment of the Volstead Act there were an estimated 100,000 speakeasies in New York City. Hurley’s was one of them. 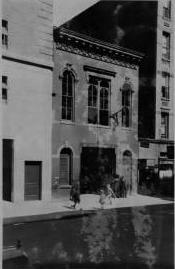 The saloon was moved to the back of the building with an unmarked entrance on 49th Street. The front section was rented to Greek florists. For additional income and camouflage the upstairs was leased to Mrs. Shea who rented out “furnished rooms;” and a barber shop, fruit stand and luggage store shared ground floor space with the hidden saloon. But there was an even bigger problem looming for the Hurley brothers. John D. Rockefeller, Jr. had begun aggressively buying up a staggering twenty-two acres of midtown property, right in the middle of Fifth Avenue’s most exclusive district, for a seemingly implausible project: Rockefeller Center. One by one he purchased buildings from Fifth to Sixth Avenue between 48th and 51st Streets. In the stranglehold of the Great Depression, none but the city’s wealthiest property owners could resist the offer to convert real estate to cash. Daniel Hurley and Patrick Daly did not own their building, but still had a long-term lease. They worded their refusal to budge as a veiled offer. Rockefeller’s agents had managed to buy the building so the saloon-keepers, realizing that the repeal of Prohibition was only months away, requested a lease buyout from Rockefeller: $250 million. And, indeed, no Rockefeller tore down Hurley’s bar. Construction had already began on the gargantuan Art Deco complex of nineteen buildings on May 17, 1930. The block of 49th to 50th Streets, Sixth Avenue to 5th Avenue was eventually demolished, leaving only the two brick Victorian buildings standing on opposite corners of a devastated landscape. Johnny Carson made the Hurley name nationally familiar while he did his show live from Rockefeller Center. It was the bar in all of his Ed McMahon drinking jokes. David Letterman did several on-air visits to the bar. NBC technicians haunted the place so regularly that among themselves it was known as Studio 1-H. The pretend old-fashioned bar took the name Hurley’s and, most likely, tourists never noticed the change. But proximity, tradition, or habit still brought the Rockefeller Center workers and celebrities into the bar until September 2, 1999. That night owner Adrien Barbey served the last glass of beer in the bar that had stood at Sixth Avenue and 49th Street for 102 years. The 64-year old bar owner, having undergone stomach and heart surgery, decided to retire. On the final day of operation, the windowsills were crammed with floral arrangements sent by patrons. As the last hours ticked away, loyal customers took away menus and matchbooks as mementoes. Today the red brick building is painted gray—a no-doubt purposeful near-match to the limestone façade of the RCA (now GE Building) that wraps it. Where three Irishmen once served beer—legally and illegally—to tough, boisterous working men, a pristine bakery sells cupcakes. The two little buildings on either side of the soaring 70-story RCA Building stand as monuments to independent businessmen who steadfastly refused to be bullied by a millionaire with limitless fortune and power. The yellow fever epidemic of 1824 hastened the development of Greenwich Village as New Yorkers wealthy enough to do so fled the overcrowded city. Seeking refuge in the open air of the little community to the north, they built rows of brick-faced homes. The growing population brought a need for additional working class residents as well--craftsmen, builders, grocers, carters and dry goods merchants. The situation provided a lucrative opportunity for real estate developers. In 1824 Charles Oakley constructed three matching Federal-style dwellings side-by-side at Nos. 47, 49, and 51 Barrow Street. Two years later he extended the row with Nos. 39, 41, 43 and 45. The two-and-a-half story wooden homes were fronted in Flemish bond brick. Intended for working class families, they had few decorative embellishments. The doorways and entrances were capped by plain brownstone lintels, and above the simple cornice the steep pitched roofs were each pierced by a single pedimented dormer. The block quickly filled with working-class families. Carpenter Jacob A. Roome moved into No. 51; Jacob Bogert, a carpenter, lived at No. 39 and mason Jacob Naugle leased No. 47. While Dr. Thompson was still living at No. 41 Barrow Street, a young former sailor was making a name for himself in the police force. When 28-year old Ira S. Garland was appointed a policeman on April 22, 1858 he was assigned to the river and harbor patrol--“his salt-water training being recognized by his superiors,” explained The New York Times. Only six days later the rookie cop earned a medal for courage “for gallant conduct in repressing a mutiny on board of the ship R. F. Starer." 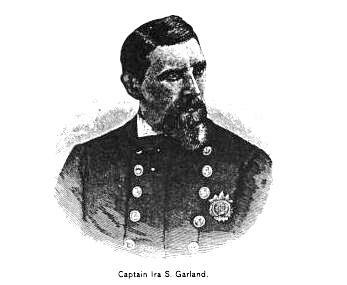 On March 4, 1867 Garland was promoted to the rank of Captain and given the command of the 14th Precinct. By 1876 Dr. Thompson was no longer at No. 41 Barrow. Instead, Captain Garland--who was now earning the comfortable salary of $2,000 a year (about $39,000 today)--was living here with his wife, and a daughter and son. Alexander Murray Garland enrolled that year in the Introductory Class of New York City College’s Commercial Course. Garland continued to make a name for himself as a hero and valiant officer. 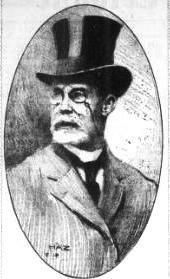 In 1874 he arrested the notorious William J. Sharkey for the murder of Robert Dunn. Sharkey subsequently made newspaper headlines by escaping from the Tombs—the brooding granite prison on Centre Street. The convicted murderer made his escape by slipping into the clothing of a female visitor, Maggie Jourdan, and walking out of the institution disguised as a woman. Three days before Christmas in 1883, a German named Frederick A. Hartman made a bold attempt on the life of dry goods merchant Alexander Turney Stewart. The millionaire lived in a white marble palace on 5th Avenue and 34th Street, across the street from Carolina Astor’s mansion. By the time Garland arrived the would-be assassin had shot and wounded one of Stewart’s watchmen, Augustus Gardiner. “Hartman resisted arrest, and acted like a man bereft of his reason,” noted Augustine Costello. Two weeks later, on January 8, Hartman committed suicide by hanging himself in his cell in the Tombs. Garland’s retirement may have earned him some well-deserved rest; but it also cut his income nearly in half. His captain’s pension was $1,375 and it was not enough to sustain him and his family. Forced to supplement his income, the former Police Captain took work where no one would have expected it—in a gambling parlor. The Evening World printed the shocking story on April 6, 1892. “Friends of ex-Police Capt. 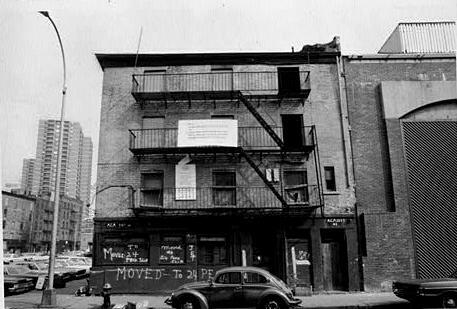 Ira S. Garland were somewhat surprised this morning to learn that the retired Captain had for some time past been employed as a sheet-writer in Murphy’s pool-room, at 154 East forty-second street,” it reported. A “pool-room” at the time was an ordinary appearing room in any building where a telephone or telegraph wire conveyed information from race tracks on races and results. Illegal horse betting was carried on here and a sheet-writer was employed to register the bets made. The scandalous revelation was not enough to stain Ira Garland’s reputation for long. When the 72-year old died in the house in August, 1902 the newspapers printed only glowing remembrances. While the Garlands lived at No. 41 Barrow Street they cautiously updated it. A pressed metal cornice replaced the simple Federal-style version around the same time that the hefty late-Victorian entrance newels were installed. At some later date the single window in the dormer was replaced by a pair of casement windows. From the street, however, No. 41 Barrow Street looks much as it did when a gallant police captain lived here with his family in the 1890s. In 1873 fashionable Fifth Avenue above 34th Street saw the opening of the elegant Windsor Hotel—one of the first incursions of commerce in the residential neighborhood. The luxurious seven-story hotel stretched along the entire block from 46th to 47th Street on the avenue lined with the imposing mansions of millionaires like Robert and Ogden Goelet, and Jay Gould. Wealthy guests came and went at the Windsor Hotel until it all came to a tragic end on St. Patrick’s Day 1899. While the parade passed below the hotel’s windows, a patron lit a cigar and carelessly tossed his match, igniting the curtains in a hallway. Before long the entire structure was ablaze and guests threw themselves to the pavement from their windows. By 4:20 the hotel had collapsed. At least 60 persons were dead and 52 injured. The charred plot of land sat vacant for six months, a brutal scar—what The New York Times called a “dreary void”--on an otherwise elegant avenue. 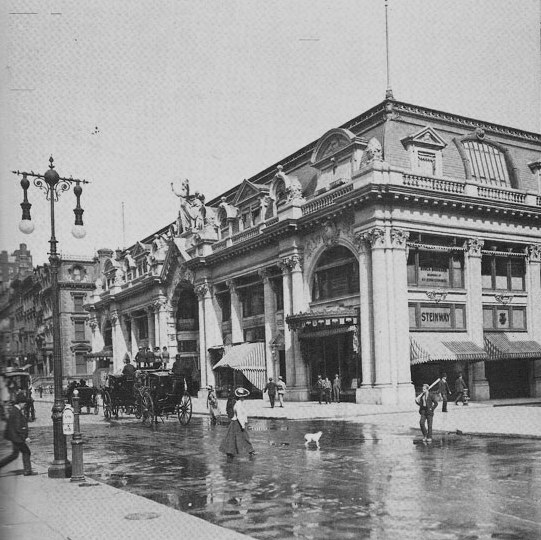 On June 21, 1900 owner Eldridge T. Gerry announced plans to erect “an arcade building” on the site. The arcade concept--an adaptation of the ancient bazaar—had been recently revived in the western world in St. Petersburg, Amsterdam and Paris. Gerry envisioned a magnificent structure in keeping with its high-toned locality “designed especially for a gallery of fine arts, a store for china ware, and a photograph gallery,” reported The New York Times. Gerry commissioned architect Charles I. Berg to design the innovative structure. 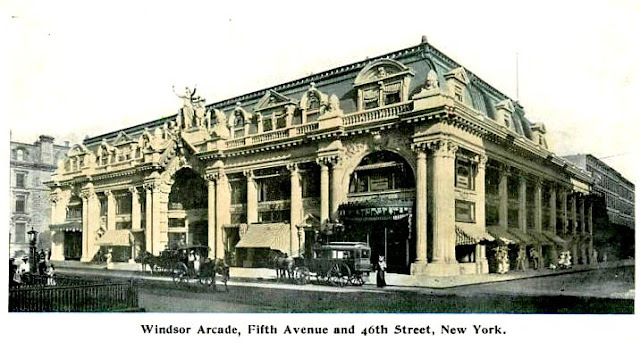 The “dreary void” would be transformed by the ebullient three-story Windsor Arcade. Reminiscent of the monumental Beaux Arts structures introduced at the World’s Columbian Exposition in Chicago in 1893, the terra cotta and iron building featured a colossal portico surmounted by a sculptural group of “Winged Genius” by Bruno Louis Zimm. Sixteen columns, 30 feet high, along Fifth Avenue were capped with ornate capitals. Behind a handsome balustrade a high mansard roof gently curved away from the cornice. Terra cotta ornamentation—olive branches, festoons and garlands of flowers—were manufactured by the Perth Amboy Terra Cotta Company. A 1905 postcard view shows an over-sized pestle on the corner advertising a pharmacy in the Arcade. Only the portion of the arcade facing Fifth Avenue was three stories tall—the rear section rose only two stories. The first floor housed 14 shops—two large shops at the corners with 12 smaller spaces between. The third floor was designed as studio spaces with skylights and windows in the mansard. Both the ground floor and third floor had 18 foot ceilings. The second floor, with 12 foot ceilings, was leased as office space. The Windsor Arcade was completed in 1901, relieving the nearby residents of the memory of the hotel fire. As The Times pointed out, they were “no longer reminded of the distressing scenes enacted before their eyes when that frightful catastrophe occurred.” Instead the newspaper praised the low profile and exuberant design of the new building. “New York has been so peopled with lofty structures along its chief arteries of commerce that the comparative lowness of the Windsor Arcade makes an agreeable variety in the street architecture,” it said. Gerry’s new building cost a staggering $2.5 million—“a good sized sum to put into such an undertaking,” said The Magazine of Business. The main entrance was lighted at night by hundreds of electric lights. The Magazine of Business felt that the handsome façade, the lights, and the innovative arcade concept would “pull” the casual passerby into the stores. 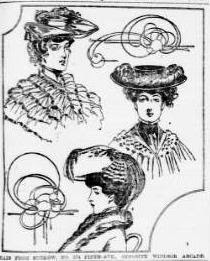 Among the first tenants was Suckow Milliners. The high-end store offered creative hats in the latest fashions, decorated with pheasant feathers and ostrich plumes, to Fifth Avenue’s well-heeled shoppers. Pach Brothers’ established its fine arts studio here. The gallery was outfitted to resemble the drawing room of one of the surrounding mansions. The reception area was hung with pastels, oil paintings and “photographic portraiture.” Jay Gould, whose brownstone home was across 47th Street to the north, had his photograph taken here as did President Theodore Roosevelt. Fencers Charles Tatham and his opponent Atherton Brownall gave the spectators a realistic exhibition of the French duello, using “razor keen” swords. As the women watched, the men fervently fought. Brownall suddenly thrust his sword, piercing his opponent’s shirt and cutting into his chest. The all-female audience gasped as Tatham’s white shirt showed blood. The Fencers’ Club was only one of several exclusive athletic clubs housed in the second floor of the Arcade. Here too were the Jockey Club, The United Hunts Racing Association, the Coney Island Jockey Club, the Westchester Racing Association, Saratoga Association and the National Steeplechase and Hunt Association. On January 10, 1907 the rules of horse racing were amended at the annual meeting of the Jockey Club. Profitable or not, on November 5, 1909 the carpet firm of W. & J. Sloane announced intentions of razing the northern half of the Arcade to build its new eight-story headquarters. The Arcade managed to survive another year, but in May 1911 wreckers began tearing down northern half of the 10-year old structure. Gerry brought Charles I. Berg back to alter the southern portion into offices. But it was not to be. Instead Robert Goelet leased the southern portion which abutted his Ritz-Carlton Hotel. He announced that a ballroom addition to the hotel designed by Warren & Wetmore would replace the southern half of the building. 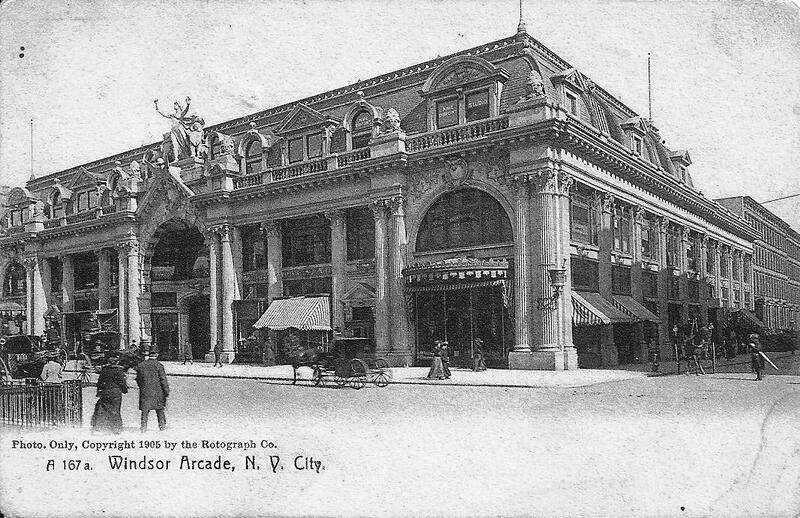 After only a decade, the Windsor Arcade, deemed by The New York Times at the time of its completion as “well-designed and handsome” was demolished. In April 1865 the Battle of Appomattox Court House resulted in the surrender of General Robert E. Lee and the beginning of the end of what New Yorkers called the War of Rebellion—the American Civil War. Before long New York City’s young men would be marching home and resuming their lives. Some of them were “laddies,” the volunteer fire fighters who protected the growing city’s buildings. The volunteer companies were disorganized and haphazardly scattered. When fire would erupt, the nearest fire houses would vie with one another to reach the blaze first, or to become the most skilled at firefighting. Although they provided a desperately needed service, the laddies earned a well-deserved reputation as rowdy, boisterous gangs whose fire houses essentially doubled as social clubs. But that all changed in 1865. Partly prompted by the widely-publicized conflagration that destroyed Barnum’s Museum that year, reformers pressured the State Assembly to organize a professional fire department. 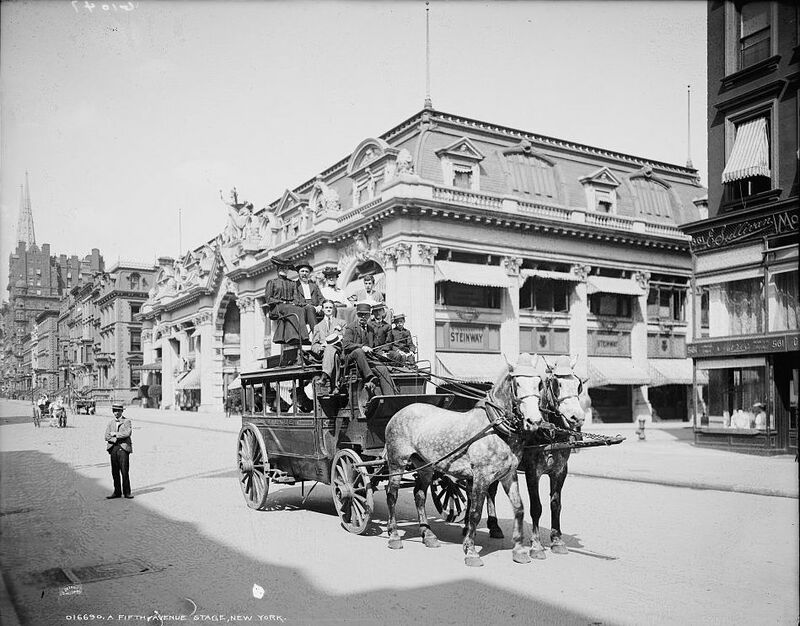 The Act of 1865 joined the cities of New York and Brooklyn with a single, paid “Metropolitan District” fire department. 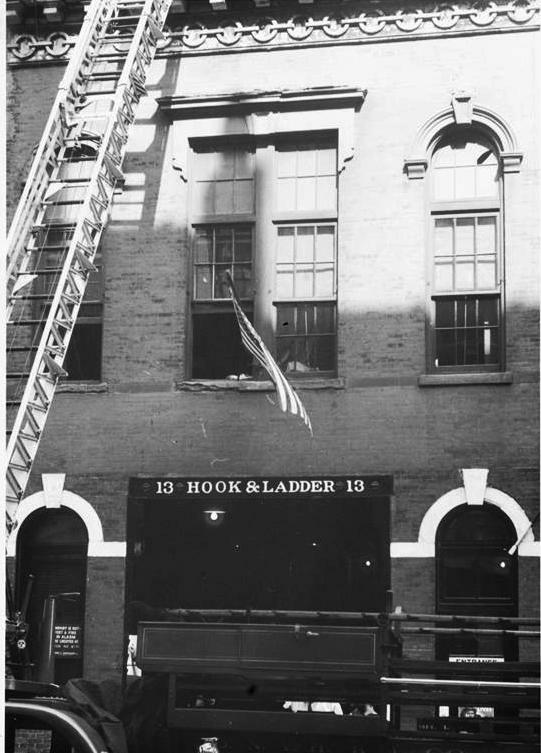 In the Yorkville neighborhood the Cornelius Anderson #10 Ladder Company was reorganized on October 11, 1865 to become the Suburban Hook & Ladder Company No. 13. The small company received a handsome red brick fire house at No. 159 East 87th Street on New Year’s Day 1868. Trimmed in deeply-carved brownstone, the two story structure was a near match to several other firehouses being rapidly erected throughout the new metropolitan district. Heavy foliate scrolled keystones graced the arched lintels of the street level and an unusual and attractive chain motif ran below the cornice. The men of Hook and Ladder Company No. 13 served valiantly throughout the decades, not always serving only the Yorkville neighborhood. 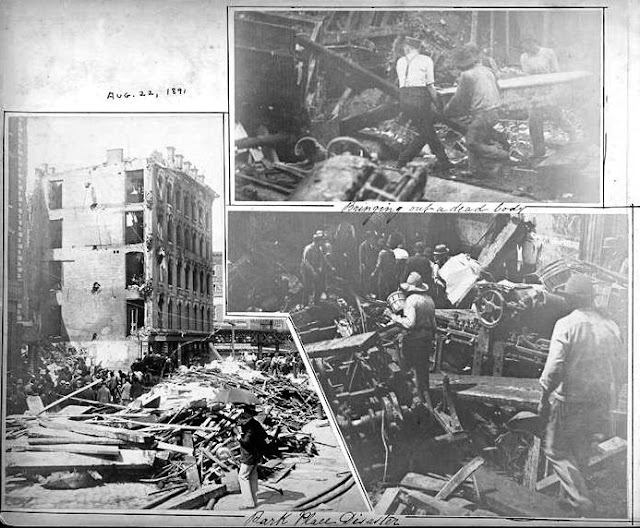 Just past noon on August 22, 1891 an explosion occurred in the five-story building that stretched from No. 68 to 72 Park Place. Children playing in front of the drugstore at No. 72 were immediately killed and a fire broke out inside. The building was filled with workers—many of them young women—employed in bookbinding and printing businesses. A restaurant was crowded with lunchtime patrons. Three days later as the search for bodies continued, the firemen of Hook and Ladder Company No. 13 arrived to help. The Evening World reported that the firemen “went to work and the squad of longshoremen returned with a fresh gang of Italians. The first thing to do was to tackle some of the heavy presses which still lie on the top of the great mass of debris in the centre of the ruins and which interfere with the search for bodies." As the Yorkville fire fighters began digging through the ruins, 42 bodies had already recovered and 111 were still missing. The old house was filled with trapped residents. When the fire fighters arrived, Mrs. Louisa Liebershultz, who lived on the second story, was standing at a window. The 50-year old woman was “shrieking and wildly waving her arms.” The men of Hook and Ladder Company No. 13 shouted for the woman to stay where she was as they began raising their 35-foot ladder. Just before the ladder reached the second floor, the flames neared Liebershultz and she panicked. “Uttering a piercing scream, she threw herself from the window,” said The Tribune. The fall was fatal. In the meantime, the fire crew frantically worked to rescue the other residents. Mrs. Mary McLean lived on the third floor and she, too, “added her screams to the general din of shouts and cries.” She obeyed the firefighters and remained in the open window until the ladder was raised. Fireman Patrick O’Keefe carried the woman to the street to the accompaniment of cheers from the crowd. When the blaze was finally extinguished, the men of Hook and Ladder No. 13 found the badly-burned body of Mrs. Martha Merten sitting upright in a chair by her closed widow. On the floor next to her was the body of her little pet dog. Had Mrs. Merten opened the window to call for help, or closed her door to delay the progress of the flames, she might have survived. Firefighters surmised that the 40-year old died of fright or heart attack before the flames reached the room. Similar tragedies occurred repeatedly throughout the Company’s history. 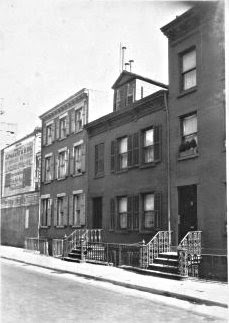 Around noon on July 8, 1908 Mrs. Mary Smith was cooking in her tenement apartment at No. 319 East 80th Street. Her gas stove exploded, setting fire to her dress. The 57-year old women tried in vain to smother the flames then ran screaming into the hallway where she dropped to the floor. Her blazing Edwardian clothing set fire to the staircase and within moments the shoddily-built hallways were filled with smoke and flame. Inside the tenement were at least 30 children who were rushed to the halls and fire escapes by their parents. “The men of Hook and Ladder Company 13 were the first to arrive, and they swarmed up the fire escapes and led or carried may women and children to the street and to the roofs of adjoining houses,” reported the New-York Tribune. Firefighter James Perry was a hero that day. Making his way to the roof of the house at No. 321, he was lowered to the fourth floor by a rope tied around his waist. “He swung, pendulum-like, until he could reach the window ledge, ad found Sadie McNamara, fourteen years old, unconscious near the window. He held the girl in his arms and his companions pulled the two to the roof,” said the Tribune. Firemen Coyle and O’Brien got into the room where young Sadie was found and rescued her mother, Elizabeth McNamara, who lay unconscious on the floor. When the flames were under control, the firemen rushed into the building and found the body of Mary Smith in the hallway. By the 1920s attempts were made to slightly modernize the Victorian firehouse. The brownstone cornice and lintels of the first floor were shaved away and the arched truck entrance was squared off. Happily the upper floor and delightful upper cornice decoration survived. 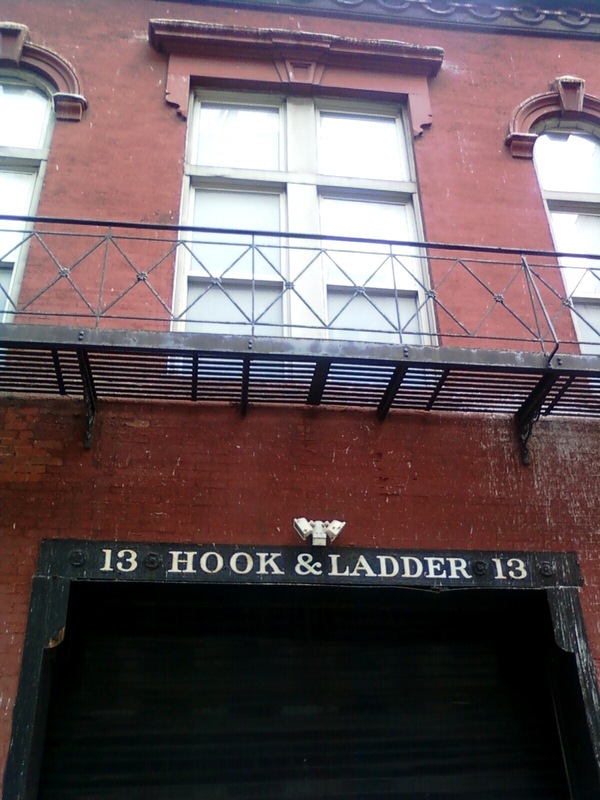 After nearly a century in its little brick firehouse, the Hook and Ladder Company moved to new quarters on East 85th Street. 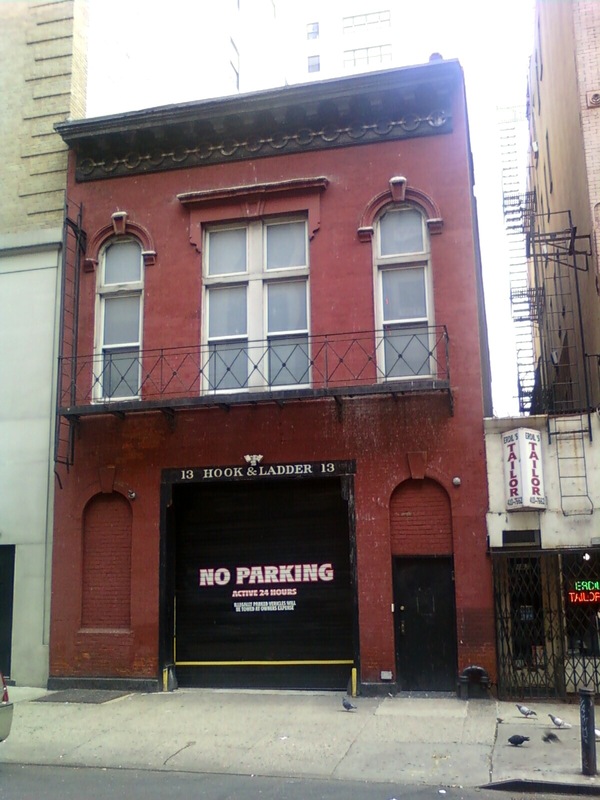 The building sat empty until November 1962 when the young artist Andy Warhol, rented the second floor from the city as his studio. Warhol offered $150 a month for what would become his first real studio. Half a century after the company moved out, the entrance still proudly remembers its roots. Today the little red firehouse looks much as it did when Andy Warhol created his art here. The façade has bee slathered with barn-red paint and one of the arched openings bricked over. But the intrepid little building still exudes a sense of history through the surviving architectural details of the upper floor.